News, tips and features from the Library. Have you heard about ASK? It’s the University’s one-stop-shop for academic skills. Are you concerned about being accused of plagiarism? Having some difficulty with statistical analysis? Struggling to write a persuasive argument in your essay? Feeling like you’re not able to manage your lecture, seminar and assignment workload? Or perhaps you are a master procrastinator who needs to just crack on with some work. The ASK (Academic Skills Kit) can help! Signposting you to the services, resources and support available across Newcastle University, it will help you identify where to go for advice and support to improve your study habits and develop skills that are invaluable for University and what comes after. ASK directs you to the correct place for support and includes online resources such as quizzes and videos, to help you better understand where you may need to grow. 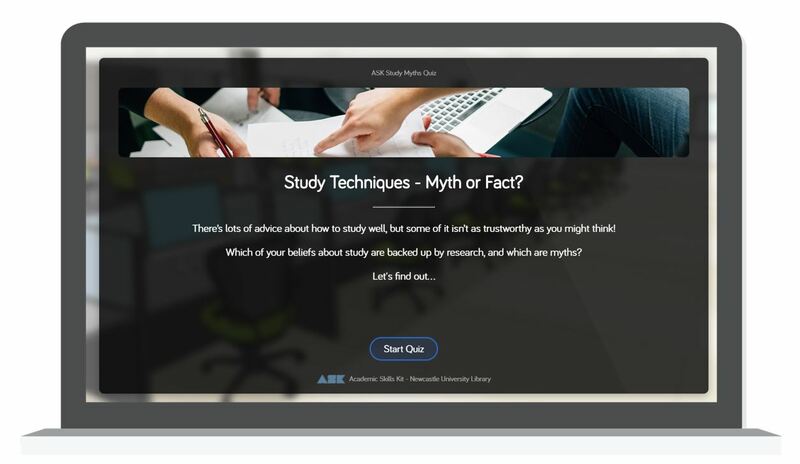 Why not start with the myth busting quiz developed by the Writing Development Centre for some quick tips on how to study well? We’re probably all familiar with the fact that the library is where you find the books, but this month, why not explore all of the other types of information that can add to your academic skills bag of tricks. The library’s Resource Guides draw together the best resources available, organised by the type of information rather than subject area. So if you are trying to find historic newspapers, company financial data, market research, standards or images you will find a resource guide for all of that! The guides are updated all the time as we add new subscriptions to our collection or identify online resources that we think will be useful for teaching and research. You’ll find the Resource Guides on the library website and as quick links on every Subject Guide. 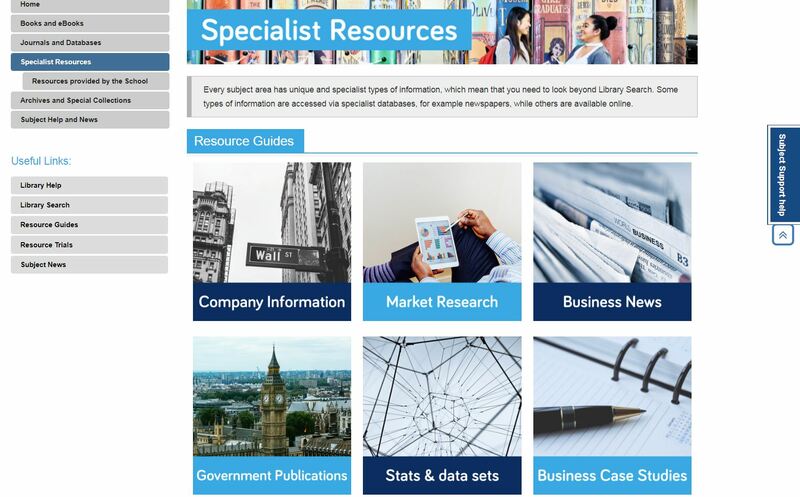 We’ve also highlighted the Resource Guides that are most commonly used for your subject area in the Specialist Resources section. So next time you need to find a newspaper article, a government paper or some statistics to analyse, visit the Resource Guides to help you identify where to look. Pick up more tips and tricks for searching on our skills guides. Passport is a global market research database that gives us statistics, analysis and reports on global markets, economies and consumers. As well as being able to search for statistics and analysis using keywords, browse by country, industry and economy, Passport highlights what they call Megatrends which are the major issues influencing consumer behaviour in today’s market. Megatrends for the UK right now include population changes, healthy and ethical living, and middle class retreat. You can access the full reports from the Passport homepage while they give useful summaries on their YouTube channel. 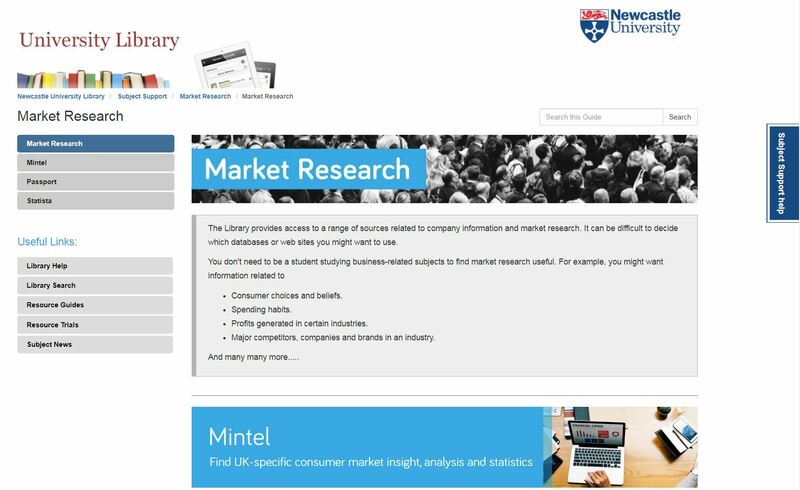 To access the Newcastle University subscription to Passport and our other market research resources, visit our Market Research resource guide. Are you using the best information to make your point? With the huge volume of information available and the speed with which you can find something on just about any topic with a simple search, it can be difficult to be sure that you are using the best quality information for your task. Your tutors will often give advice such as recommending that you use academic or peer-reviewed journal articles, and it can be tempting to stick to ‘safe’ types of information such as books. But depending on your assignment topic, you will need to explore a breadth of different information types, including many that will be online. So how do you know which ones to you? You will need to consider many issues, including authority, accuracy, objectivity, currency and coverage within an information source. This will help you make decisions about the quality of the information, its reliability and what role it could play within your thinking. You will evaluate information all the time without thinking about it. It doesn’t need to be a conscious or difficult task. Our Six Questions video will help give you some ideas for the types of questions to keep in mind to make your own judgement. You may also sometimes decide to include a piece of information, even though it may not be from a credible source or its impartiality is questionable, because it illustrates the point you are trying to make. Being aware of your reservations about a reference allows you to be more confident in your judgment. Posted on 14th January 2019 11th January 2019 Author Emily dottCategories Fake News, Top tipsTags Agribusiness and Food Marketing, Agriculture, Animal Science, Applied Linguistics, Archaeology, Architecture, Planning and Landscape, Biology and Zoology, Biomedical Sciences, Business, Chemical Engineering, Chemistry, Chinese and Japanese, Civil Engineering, Classics and Ancient History, Combined Honours, Computing, Countryside Management and Rural Studies, Cross Cultural Communication, Culture and Heritage, Dentistry, Earth Sciences and Geosciences, Education and Educational Psychology, Electrical and Electronic Engineering, English Language and Linguistics, English Literature, Environmental Engineering, Environmental Science, Film, Fine Art, French, Geography, Geomatics, German, german studies, History, Italian, Joint Honours, Law, Marine Science, Marine Technology, Mathematics and Statistics, Mechanical Engineering, Media, Culture and Heritage, Medicine, Music, Nutrition, Pharmacy, Philosophical Studies, Physics, Planning and Landscape, Politics, Psychology, Renewable Energy, Sociology, Spanish and Latin American, Speech and Language Sciences, Sport and exercise science, Translating and Interpreting, Transport Planning, Water ManagementLeave a comment on Are you using the best information to make your point? Family overload this festive season? The library is here for you this vacation. Today we are getting into the festive spirit in the Liaison team and enjoying our last day at work before the Christmas vacation. The team will be back in the office on 2nd January but until then, there is plenty of Library support available. The Philip Robinson Library will be open throughout the vacation with the exception of Tuesday 25 December 2018 and Tuesday 1 January 2019. 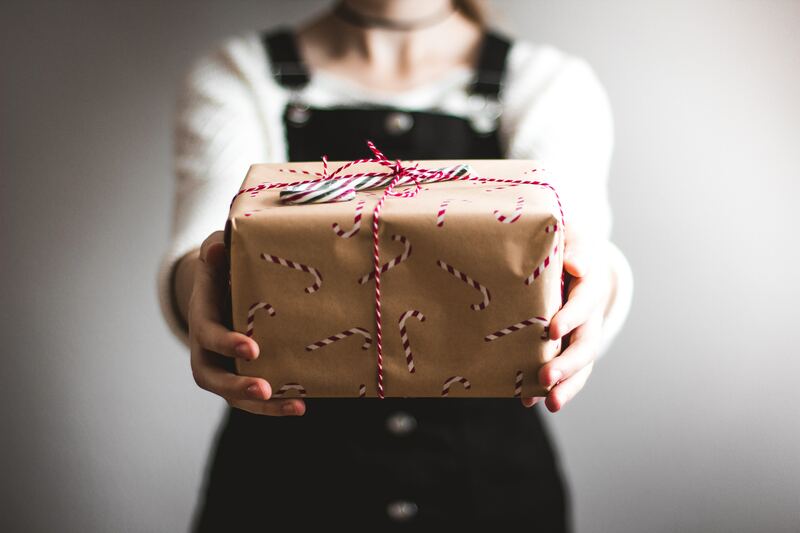 Between Saturday 22nd December and Monday 31st December, we are open as self-service and access the building is by Newcastle University Smartcard only. Find out more on the Library website. If you have an urgent question, you will find 24/7 support via our out-of-hours Live Chat service, provided by a co-operative of academic librarians from around the world. If they can’t answer your query, they will pass it back to our Library staff who will contact you when full service resumes on Wednesday 2 January 2019. Believe us, there is no such thing as a stupid question and you’ll probably find that your question has been asked many times before! Why not check the Library Help FAQs to see if we have already provided an answer. Working on an assignment or revising, and unsure where to find the information you need? Visit your library Subject Guide for advice and quick links to specialist information resources for your subject. Not in Newcastle? Online resources – any time, anywhere. You can access all of our e-resources from anywhere in the world, so long as you have an internet connection. We wrote this blog post full of tips last week. Posted on 21st December 2018 Author Emily dottCategories Top tipsTags Agribusiness and Food Marketing, Agriculture, Animal Science, Applied Linguistics, Archaeology, Architecture, Planning and Landscape, Biology and Zoology, Biomedical Sciences, Business, Chemical Engineering, Chemical Engineering NUIS, Chemistry, Chinese and Japanese, Civil Engineering, Classics and Ancient History, Combined Honours, Computing, Countryside Management and Rural Studies, Cross Cultural Communication, Culture and Heritage, Dentistry, Earth Sciences and Geosciences, Education and Educational Psychology, Electrical and Electronic Engineering, Electrical Power Engineering NUIS, English Language and Linguistics, English Literature, Environmental Engineering, Environmental Science, Film, Fine Art, French, Geography, Geomatics, German, german studies, History, Italian, Joint Honours, Law, Marine Science, Marine Technology, Marine Technology NUIS, Mathematics and Statistics, Mechanical Engineering, Mechanical Engineering NUIS, Media, Culture and Heritage, Medicine, Music, Nutrition, Pharmacy, Philosophical Studies, Physics, Planning and Landscape, Politics, Psychology, Renewable Energy, Sociology, Spanish and Latin American, Speech and Language Sciences, Sport and exercise science, Translating and Interpreting, Transport Planning, Water ManagementLeave a comment on Family overload this festive season? The library is here for you this vacation. Going home for the holidays? Top tips for accessing resources off campus. The Library subscribes to over 300 specialist subject databases, 26,000 ejournals and has access to over 6 million ebooks. 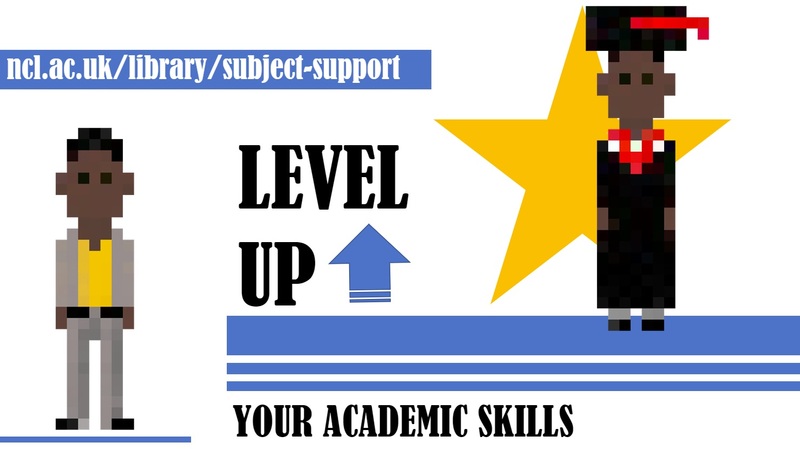 When you are on campus or use a computer connected to the University network, ebook and ejournal providers will recognise you as a member of the University and allow you access to the resource. You will see the University logo on the page and if you are on things like Google Scholar, you will be given the option to “Find at Newcastle University”. This works because it recognises the IP address of the University. It all works like magic and it is easy to think that it is all freely available. However, when you’re off campus, working from home or perhaps in a different library, you won’t be automatically recognised. This can cause you some difficulty accessing resources and you’ll probably find that you are locked out of the full-text and asked to pay large amounts for articles. If you are working off campus, follow our tips to make sure that you are able to access all of the resources that you are entitled to as a member of Newcastle University. If you perform a search in Library Search, you will be automatically prompted to log in to online resources with your University username and password, even when you are off campus. 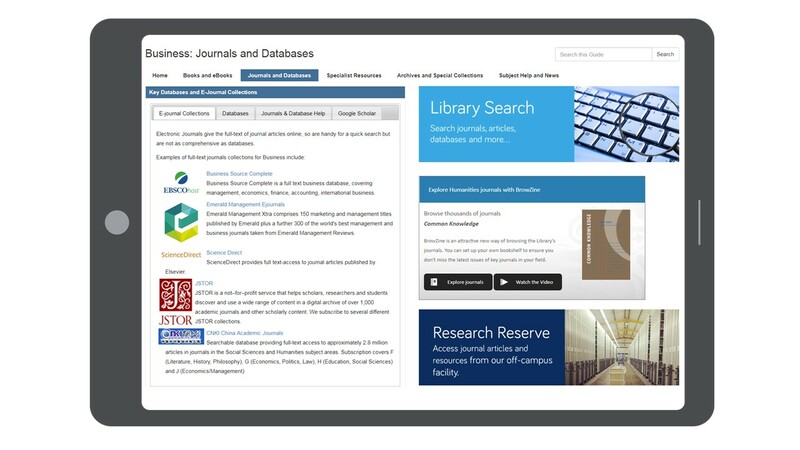 But did you know you can also search it to access whole journal titles and databases, such as Scopus and Web of Science? Access the database through Library Search and you will be prompted to login, to easily perform your search and download the full-text. As we have access to so many databases and specialist resources, we’ve drawn together the best ones for your discipline on your Subject Guide. Clicking on the links in the Subject Guide will take you through a route that will prompt you to log in with your University username and password. 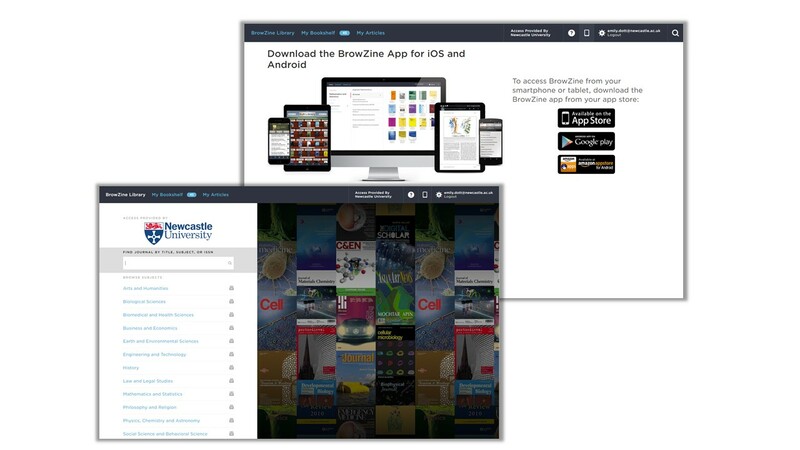 Have you created your own journal shelf or downloaded the Browzine app? Browzine is a way of accessing ejournal titles for your subject, and to read the most recent articles, just like flicking through a magazine. As you set up your personal account using your University email address, Browzine will always recognise you as a member of the University and give you access to the full-text. Logging into RAS when you are off campus allows you to work within the University network. This will enable journal and database providers to automatically recognise you as a member of the University, just as it would work on campus. We get a lot of enquiries from staff and students who aren’t sure if we have a subscription to a journal or an electronic version of a book. This is sometimes because they are not logged in or have found a reference through a search engine such as Google Scholar. 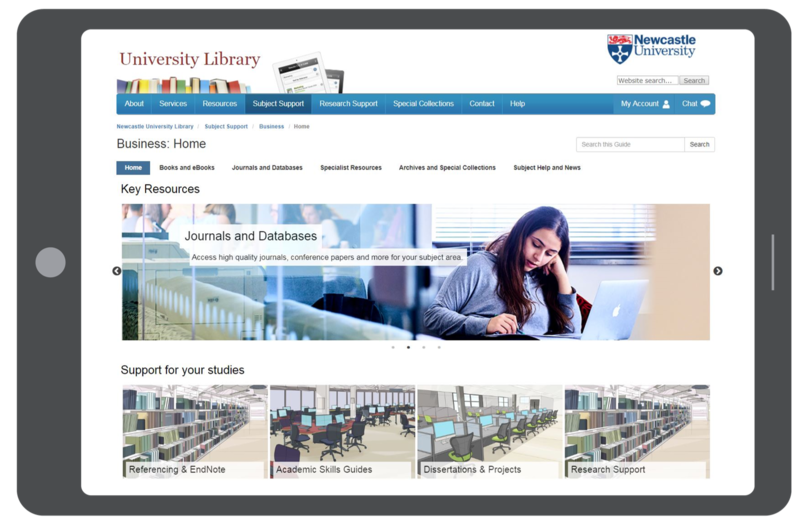 If you are on the website of a journal or a database, the quickest way to check if you are logged in, is to look around the screen to see if you can spot the University logo or name. This is often at the top right or below the search boxes on the homepage of a database or journal/ ebook platform. There are times when you’ll have done everything right and you are still not recognised as being able to access the resource. In this case, it is always worth trying to log in again within the platform. Look to the top right of the screen for a link that says institutional log in, sign in via your University or it might mention something called Shibboleth. This will allow you to log in with your University username and password. If you’re in any doubt, you can always chat with us online 24/7 or send us an enquiry via Library Help. We’ll probably ask you to send us a picture of what you can see on screen, as this will help us spot any problems. You will find more tips for working with Library resources when you away from Newcastle on our distance learners library guide. Posted on 13th December 2018 31st July 2018 Author Emily dottCategories Top tipsTags Agribusiness and Food Marketing, Agriculture, Animal Science, Archaeology, Architecture, Planning and Landscape, Biology and Zoology, Biomedical Sciences, Business, Chinese and Japanese, Civil Engineering, Classics and Ancient History, Combined Honours, Countryside Management and Rural Studies, Cross Cultural Communication, Culture and Heritage, Earth Sciences and Geosciences, Education and Educational Psychology, Electrical and Electronic Engineering, English Language and Linguistics, English Literature, Environmental Engineering, Environmental Science, Film, Fine Art, French, Geography, Geomatics, German, History, Law, Marine Science, Marine Technology, Mathematics and Statistics, Mechanical Engineering, Media, Culture and Heritage, Music, Nutrition, Philosophical Studies, Physics, Planning and Landscape, Politics, Sociology, Spanish and Latin American, Sport and exercise science, Translating and InterpretingLeave a comment on Going home for the holidays? Top tips for accessing resources off campus. Cook up your references more quickly by managing your information. The amount of information we gather and read on a daily basis can be really overwhelming. If you are reading for seminars, essays and dissertations, you can quickly lose track of the websites you visited, articles you downloaded and books you’ve read. But there are some quick and easy ways to manage the information you find, to be a little more organised and helping you reference it further down the line. Click on the pin icon for the records of any items that interest you as you go, and add all of the books, ebooks and articles you use for your work to your Library Search favourites. You can tag items with a label for the theme you are researching or even a module code or assignment, to help you group them together and find them when you come to do your referencing. 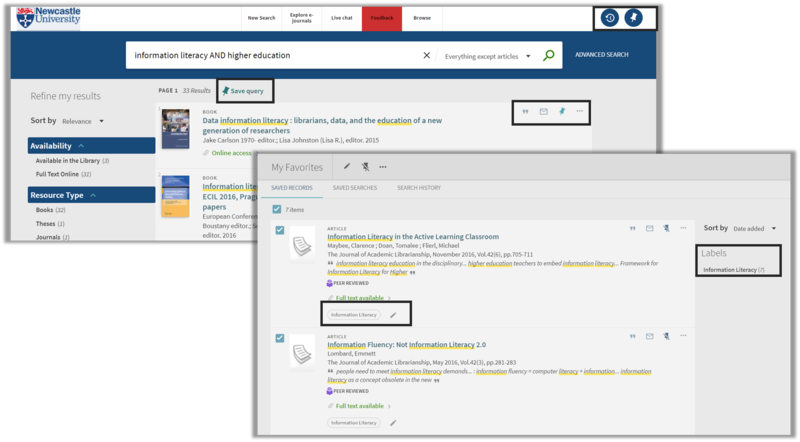 In Library Search and subject databases such as EBSCO and ProQuest, as well as Google Scholar, you will find the option to copy or download a simple reference. This can then be copied and pasted into a work document to form the start of your reference list. With a little tidying up, you will have the basic information you need to compile a reference and save yourself the time of recording the full details manually. But be warned – these references are never perfect! They often include information that you don’t need or have missing punctuation and formatting, so you will need to give them a quick tidy up. Use referencing guidance such as Cite Them Right to help you spot any errors. How often have you found the perfect article, clicked onto a different page or moved onto a different task, only to forget what it was called. Or found a load of useful articles but then forgotten how you filtered your results to find them? This is where your search history an be really useful. If you log into Library Search, you can view your search history and save any useful searches by clicking on the save query pin icon. You will find the option to save your searches in most of the subject databases too. To do this, you will often need to register for a personal account on the platform. Once you have saved your search, you can also do more advanced things, such as set up an alert that emails you whenever new articles are added to the database that match your search criteria. 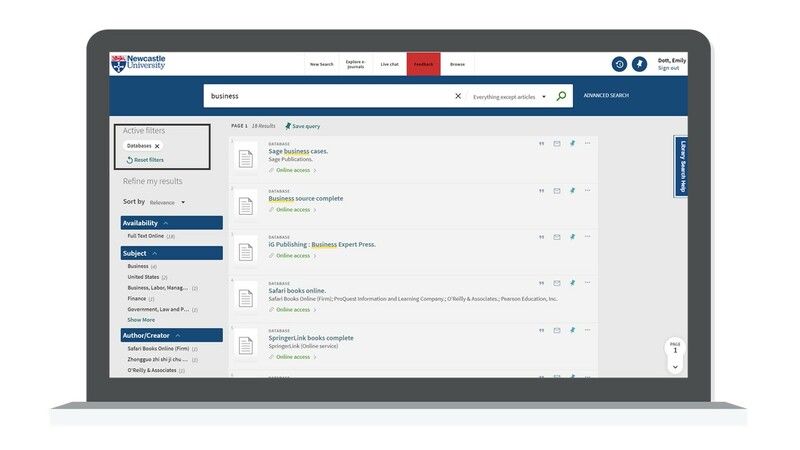 Reference management tools allow you to build and maintain your own library of references. You can enter reference information manually or you can import them directly from Library Search, Google Scholar and subject databases. You can also upload the full-text pdfs, images or notes to the reference, so that everything is kept safely in one place. 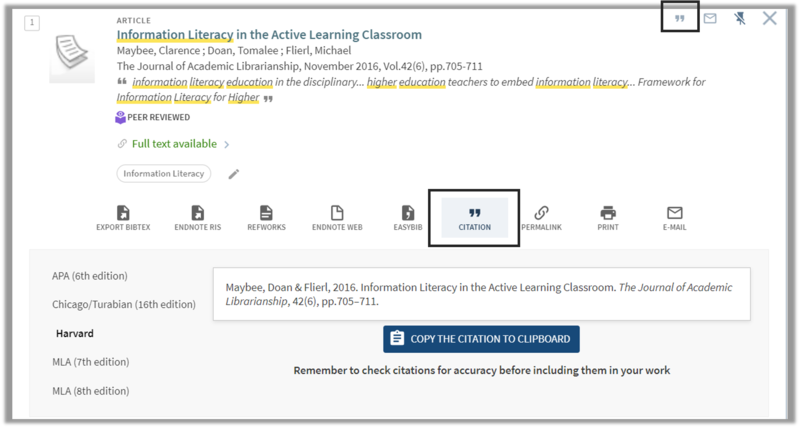 When you begin to write, the software will allow you to “cite while you write”, adding your in-text citation and building your reference list for you. The University has a subscription for EndNote which is available in all University clusters, via RAS and as EndNote Online. You’ll find information about how to get started with EndNote on our EndNote library guide. Posted on 7th December 2018 7th December 2018 Author Emily dottCategories Top tips, UncategorisedTags Agribusiness and Food Marketing, Agriculture, Animal Science, Applied Linguistics, Archaeology, Architecture, Planning and Landscape, Biology and Zoology, Biomedical Sciences, Business, Chemical Engineering, Chemical Engineering NUIS, Chemistry, Chinese and Japanese, Civil Engineering, Classics and Ancient History, Combined Honours, Computing, Countryside Management and Rural Studies, Cross Cultural Communication, Culture and Heritage, Dentistry, Earth Sciences and Geosciences, Education and Educational Psychology, Electrical and Electronic Engineering, Electrical Power Engineering NUIS, English Language and Linguistics, English Literature, Environmental Engineering, Environmental Science, Film, Fine Art, French, Geography, Geomatics, German, german studies, History, Italian, Joint Honours, Law, Marine Science, Marine Technology, Marine Technology NUIS, Mathematics and Statistics, Mechanical Engineering, Mechanical Engineering NUIS, Media, Culture and Heritage, Medicine, Music, Nutrition, Pharmacy, Philosophical Studies, Physics, Planning and Landscape, Politics, Psychology, Renewable Energy, Sociology, Spanish and Latin American, Speech and Language Sciences, Sport and exercise science, Translating and Interpreting, Transport Planning, Water ManagementLeave a comment on Cook up your references more quickly by managing your information. A common mistake made in referencing is grouping all sources found online under the category and reference type of a website. Your aim should be to reference the information you have in front of you rather than where it was sourced. Simply grouping items found online as a website would be the equivalent of referencing a book by the publisher details rather than the author and title. For example, a government publication found online would be referenced like this in Chicago. United Kingdom. Department for Education. Cloud computing: how schools can move services to the cloud. London: The Stationary Office, 2016. Accessed: February 01, 2018. https://www.gov.uk/government/publications/cloud-computing-how-schools-can-move-services-to-the-cloud. An electronic journal article might appear like this in APA. While a video posted on the Tate website would look something like this in Harvard. TateShots (2016) Grayson Perry: think like an artist. Available at: http://www.tate.org.uk/context-comment/video/grayson-perry-think-artist-tateshots (Accessed: 27 November 2018). Identifying the type of information you are using as well as the source, are essential skills of evaluation and developing a critical approach to information. In many cases you will be unconsciously using your judgment to assess the value of information for your purpose. So when you are using any source of information, ask yourself what it is you are looking at, what details are recorded about it and whether it measures up as a quality piece of information. You’ll find more guidance about evaluating information on our Evaluating Information guide. Posted on 5th December 2018 27th November 2018 Author Emily dottCategories Top tipsTags Agribusiness and Food Marketing, Agriculture, Animal Science, Applied Linguistics, Archaeology, Architecture, Planning and Landscape, Biology and Zoology, Biomedical Sciences, Business, Chemical Engineering, Chemical Engineering NUIS, Chemistry, Chinese and Japanese, Civil Engineering, Classics and Ancient History, Combined Honours, Computing, Countryside Management and Rural Studies, Cross Cultural Communication, Culture and Heritage, Dentistry, Earth Sciences and Geosciences, Education and Educational Psychology, Electrical and Electronic Engineering, Electrical Power Engineering NUIS, English Language and Linguistics, English Literature, Environmental Engineering, Environmental Science, Film, Fine Art, French, Geography, Geomatics, German, german studies, History, Italian, Joint Honours, Law, Marine Science, Marine Technology, Marine Technology NUIS, Mathematics and Statistics, Mechanical Engineering, Mechanical Engineering NUIS, Media, Culture and Heritage, Medicine, Music, Nutrition, Pharmacy, Philosophical Studies, Physics, Planning and Landscape, Politics, Psychology, Renewable Energy, Sociology, Spanish and Latin American, Speech and Language Sciences, Sport and exercise science, Translating and Interpreting, Transport Planning, Water ManagementLeave a comment on When is a website not a website?